Solving word search puzzles should tax your mind, not your eyes. Luckily, puzzlesmith Mark Danna has provided plenty of word search challenges with large type for your enjoyment. The letters in the grid are large, and so are the letters in the word lists, so if you still can't find a word, it won't be because you couldn't read it. 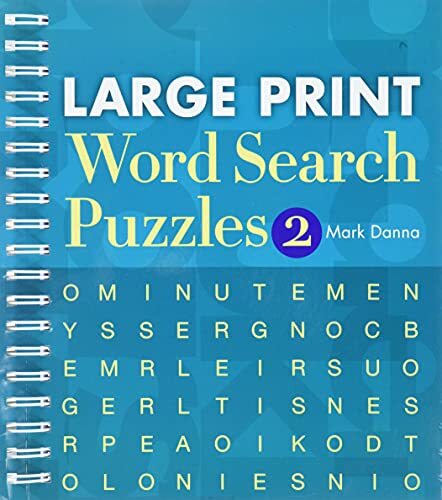 Get Large Print Word Search Puzzles 2 and see what you've been missing. Mark Danna is a professional word search puzzlemaker and the author of 15 word search books. Since 1991, Danna has written United Media's syndicated newspaper puzzle Word Gurdy. He is the coauthor of 365 Brain Puzzlers, American Mensa's long-running, annual, page-a-day puzzle calendar, and was also a staff writer for Who Wants to Be a Millionaire.